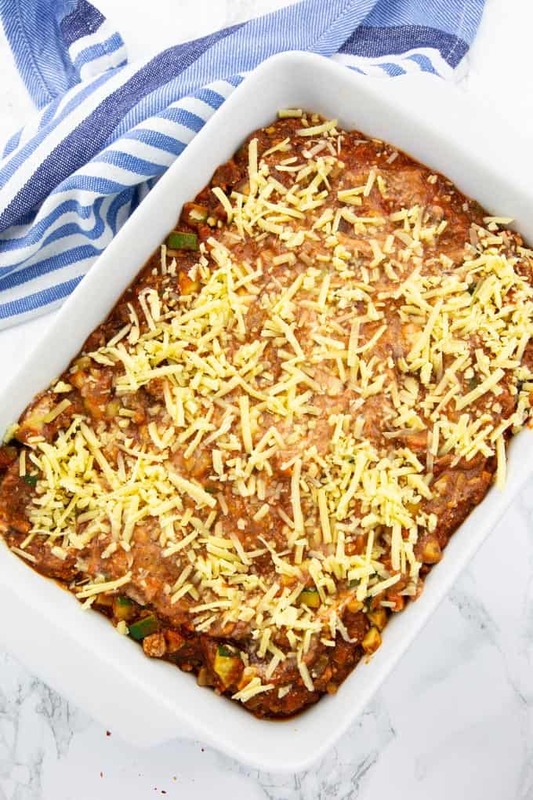 This meatless lasagna with tofu Bolognese sauce, zucchini, carrots, and mushrooms is SO delicious! The perfect meal for a relaxed evening. Maybe even with a nice glass of red wine? It’s 100 % vegan, packed with flavor, and easy to make! Oh, how I LOVE lasagna! It has been one of my favorite meals for such a long time. And this didn’t change when I became vegan six years ago. I still love making lasagna and even more eating it. This vegan lasagna is one of my favorite pasta recipes! The main ingredient in this vegan lasagna is tofu, which I paired with red wine, onions, lots of garlic, and fresh veggies. Oh and of course tomatoes. 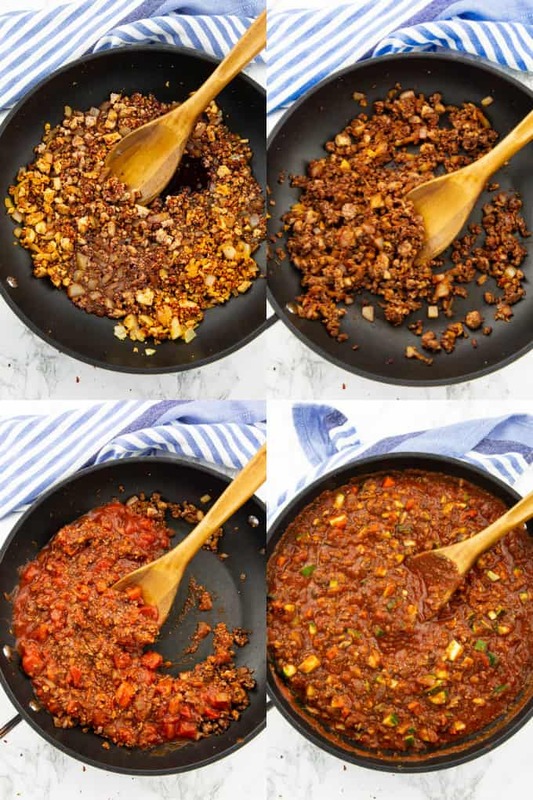 I also love having this vegan Bolognese sauce with spaghetti. It’s one of our regular weeknight meals. We make it at least once a week. It means pure comfort food for us! 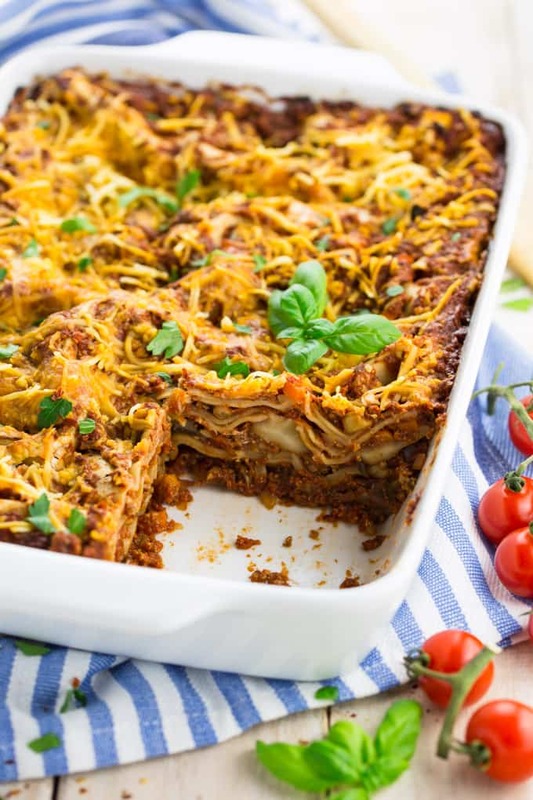 The preparation of this vegan lasagna takes a while but the recipe itself is pretty easy. 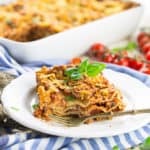 I can promise you it will be such a flavorful meal and you definitely won’t miss the ground meat in this vegan lasagna! STEP 1: Start by crumbling the tofu with your hands. 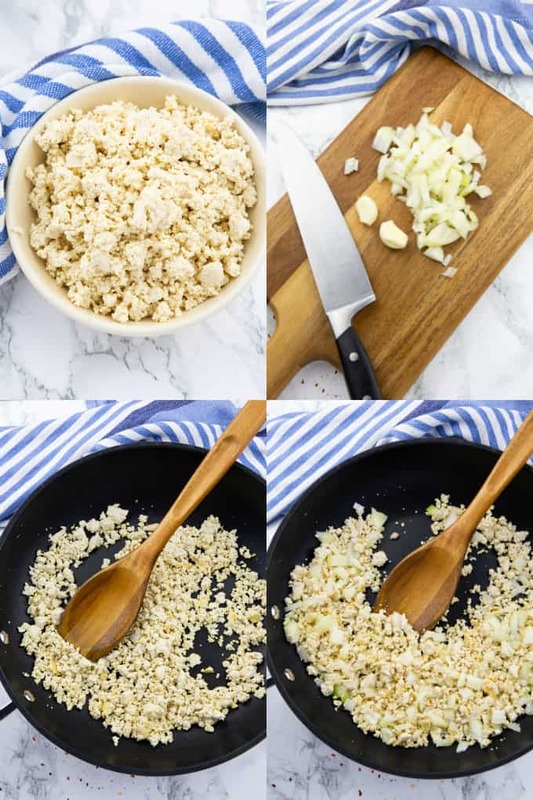 In a large pan, heat the olive oil and pan-fry the crumbled tofu for about 3 minutes. Then add the chopped onion and cook for another 4 minutes. Then add the garlic. After one minute, add the tomato paste and cook for 2 more minutes. STEP 2: Deglaze with red wine and cook for 3 minutes. Then add the diced tomatoes as well as the pureed tomatoes and season with oregano, basil, salt, and pepper. STEP 3: While you make the tofu Bolognese sauce, pan-fry the vegetables in a second pan. Heat some oil and cook them for about 6 minutes. Season with salt and pepper. Once the Bolognese sauce is ready, add the veggies and stir well. STEP 4: Add a cup of the Bolognese sauce at the bottom of your casserole dish. Then add a layer of lasagna sheets, then again Bolognese sauce, and top it with some crème frâiche (or homemade basil ricotta). Continue with two more layers of sauce and lasagna sheets. Put the rest of the Bolognese sauce on top and sprinkle with vegan cheese. STEP 5: Preheat your oven to 350 °F and bake the lasagna for 30-35 minutes, depending on your oven. Enjoy the lasagna with a green side salad and maybe a glass of red wine. I strongly recommend using very firm tofu for this recipe. It will not work with silken tofu. As some of you might know, wine is not always vegan as animal-derived fining agents are often used in the production of wine. So make sure to buy a vegan brand if you want this lasagna to be 100 % vegan. I used store-bought vegan crème frâiche for my vegan lasagna, but if you can’t get hold of it you can also use my homemade basil ricotta or also spinach ricotta. I used it for the first vegan lasagna I posted on my blog and it was a huge hit with my family. Sorry about the quality of the photos, it’s a super old post. 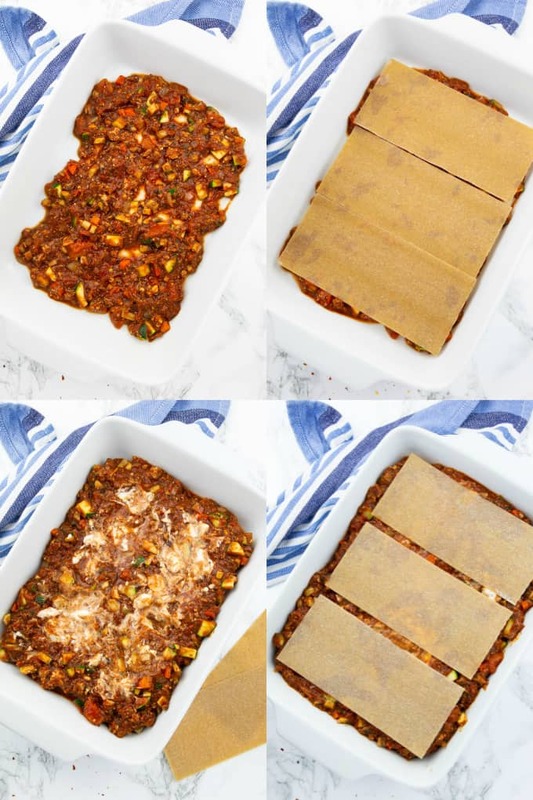 If you want you can freeze this vegan lasagna to have a delicious ready-made meal on hand for nights when you don’t have much time to cook. You can either freeze it baked or unbaked. Let it thaw overnight and then cover the baking dish with aluminium foil while baking. 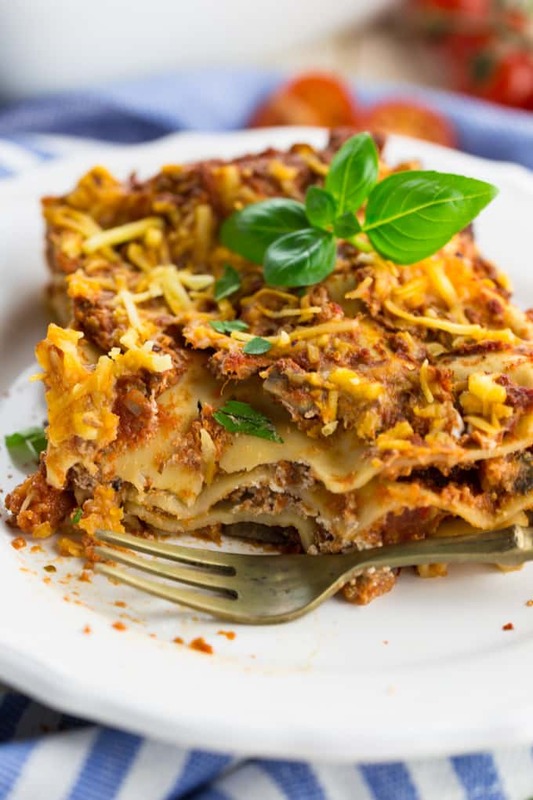 If you want to make this vegan lasagna healthier, you can also use whole wheat lasagna noodles. I’ve even tried it with green lentil lasagna noodles and it turned out super delicious as well. Do lasagna noodles have eggs in them? 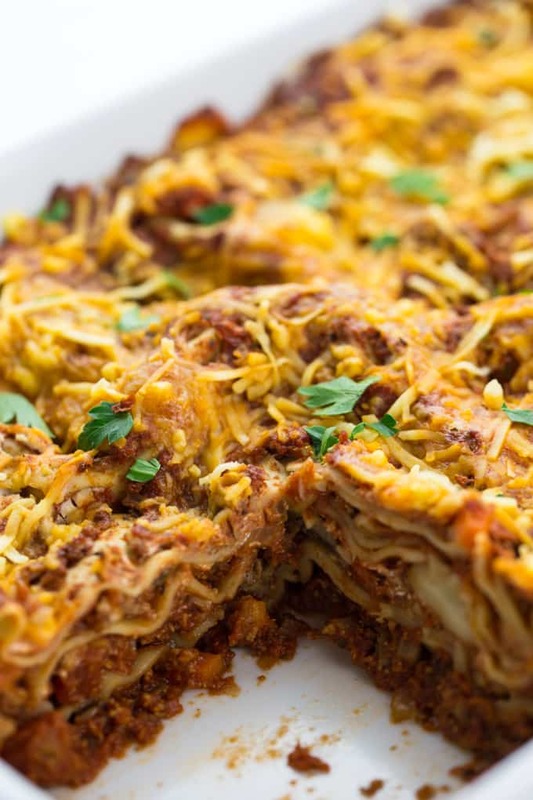 There are many lasagna noodles that are completely egg and dairy-free. 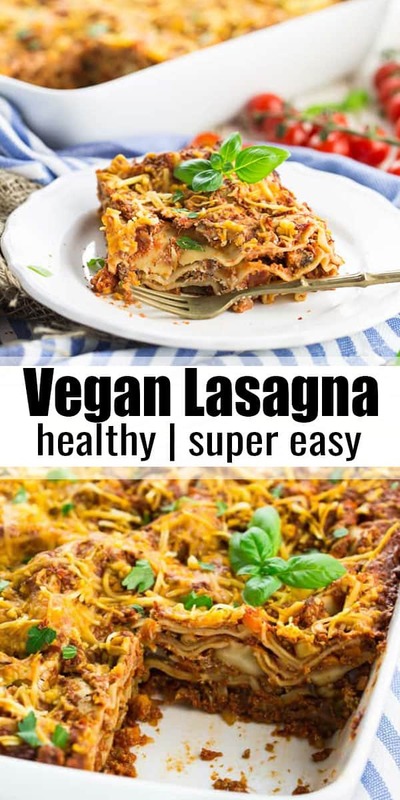 So it should be rather easy for you to find vegan lasagna noodles. However, you should still check the ingredient list. No, you don’t need to boil the noodles before you assemble and bake the lasagna. The heat from the cooking sauce in the oven will be enough to cook the noodles. So no extra work needed! 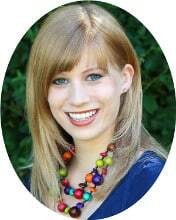 Can I freeze this lasagna? Yes, freezing lasagna works pretty well. You can either freeze it baked or unbaked. Let it thaw overnight and then cover the baking dish with aluminium foil while baking. Bake it for 30-40 minutes at 350 °F. Remove the aluminium foil for the last 10 minutes of baking, so your lasagna can get a crispy crust. And if that’s still not enough, also check out my roundup of 31 delicious vegan pasta recipes for even more ideas. I know this vegan lasagna is not one of my quickest and easiest recipes, but it’s really worth the work. It’s SO good! I hope you like this meatless lasagna as much as we do! 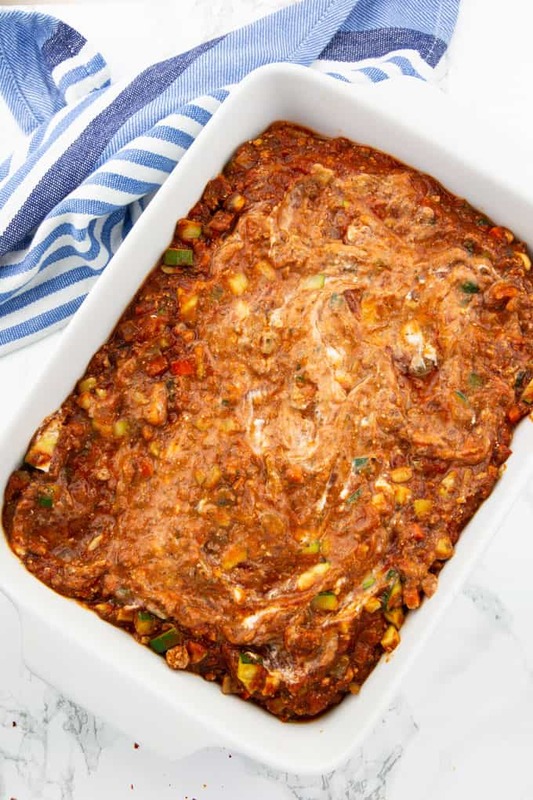 This meatless lasagna with tofu Bolognese sauce, zucchini, carrots, and mushrooms is SO delicious! The perfect meal for a relaxed evening. Maybe even with a nice glass of red wine? It's 100 % vegan, packed with flavor, and easy to make! 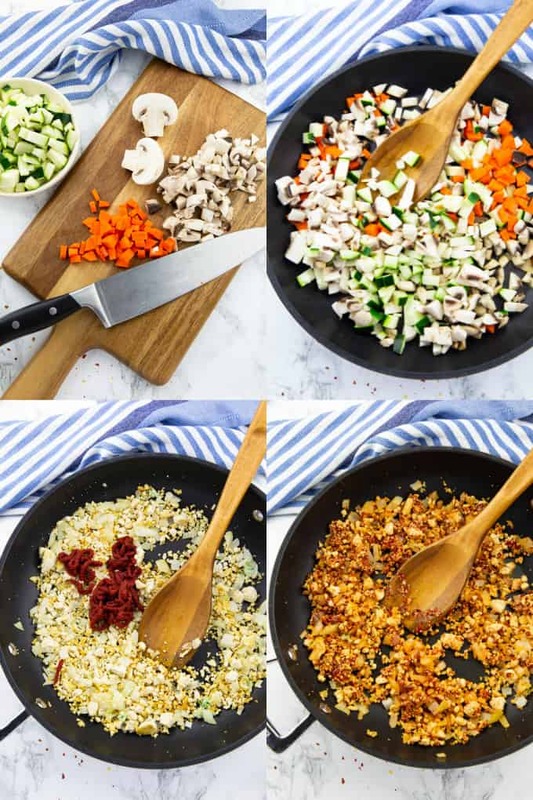 While you make the tofu Bolognese sauce, pan-fry the vegetables in a second pan. Heat some oil and cook them for about 6 minutes. Season with salt and pepper. Once the Bolognese sauce is ready, add the veggies and stir well. Add a cup of the Bolognese sauce at the bottom of your casserole dish. Then add a layer of lasagna sheets, then again Bolognese sauce, and top it with some crème frâiche (or homemade basil ricotta). Continue with two more layers of sauce and lasagna sheets. Put the rest of the Bolognese sauce on top and sprinkle with vegan cheese. Preheat your oven to 350 °F and bake the lasagna for 30-35 minutes, depending on your oven. Enjoy the lasagna with a green side salad and maybe a glass of red wine. I used store-bought vegan crème frâiche for my vegan lasagna, but if you can't get hold of it you can also use my homemade basil ricotta or also spinach ricotta. I used it for the first vegan lasagna I posted on my blog and it was a huge hit with my family. Sorry about the quality of the photos, it's a super old post. 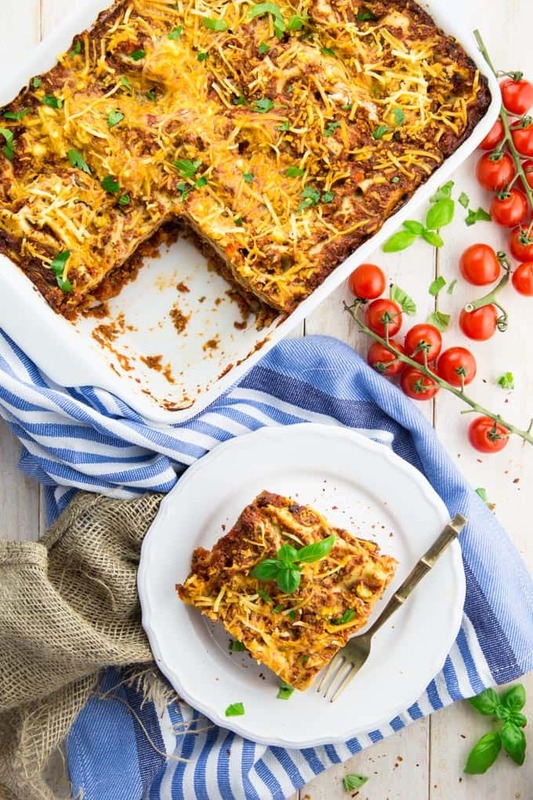 If you want you can freeze this vegan lasagna to have a delicious ready-made meal on hand for nights when you don't have much time to cook. You can either freeze it baked or unbaked. Let it thaw overnight and then cover the baking dish with aluminium foil while baking. 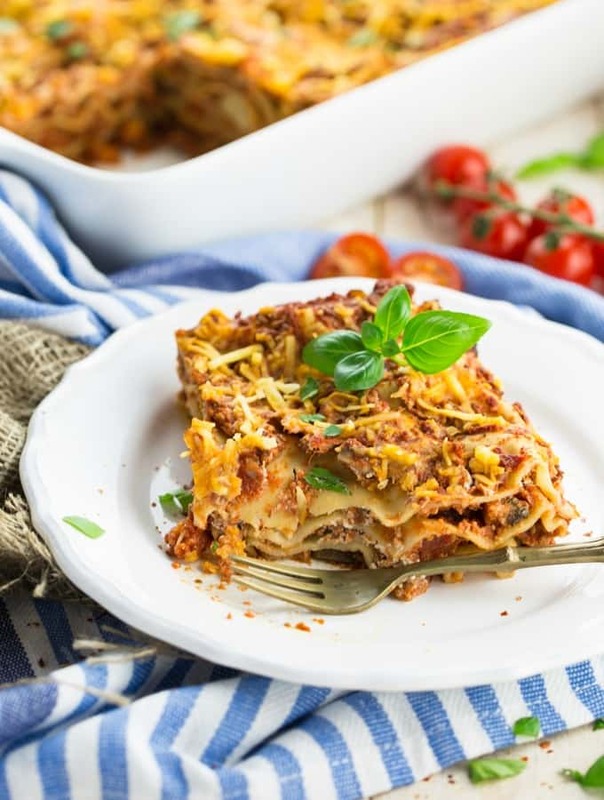 If you want to make this vegan lasagna healthier, you can also use whole wheat lasagna noodles. I've even tried it with green lentil lasagna noodles and it turned out super delicious as well. Lasagna has always been a favorite of mine, and your version looks incredible! This may be a dumb question, but is creme fraiche another term for sour creme? In other words, if I bought a vegan sour cream would it work for this recipe? It looks delicious… and I love lasagna. I just want to get it right. Also, do you this if this lasagna was assembled and placed in a refrigerator for a day or maybe just overnight that it would be more flavorful like other lasagna recipes? And by, “do you this if is…” I meant to say, “do you think if this…”* sorry ???? Let me know if you got any other questions or need help with the recipe. Hope you like it! I love lasagna too but it definitely takes some time. I usually prep everything separately then have it all ready when I want to put it together. This look delicious!!! That looks so meaty for a meatless lasagna! Definitely no missing out with this hearty meal. My daughter was just requesting lasagna tonight. Unfortunately, I didn’t even have lasagna noodles or tomatoes. When I get them though, we’ll be having this! Yum! I love lasagna and this meatless version looks 10,000 times better than a meat version! Made this tonight and my husband loved it! Just a couple of questions … you listed soy sauce in the ingredients but it wasn’t in the cooking instructions. I left it out, but curious about it. Also, 2 tablespoons of oregano seemed like a lot, it doesn’t make it too bitter? I put in 1 tablespoon. My husband and I really loved this vegan lasagna! The tofu sauce was SO good!! I’m sure it would also be great with spaghetti. Thanks so much for the recipe! I just made this vegan lasagna and it was soooo good!! Definitely a keeper! This was the first vegan lasagna I’ve tried and it turned out great. I couldn’t find vegan creme fraiche or sour cream, so I made the basil ricotta. The only thing I changed was using spinach instead of basil. Very good! Thanks for the delicious recipe! I have done this vegan lasagna last night. We are all pleased my family member with this. Really this incredibly delicious and super healthy. I have got actual color, flavor, and taste. Thanks for the presentation such type of vague less recipe.